More than just Good Tails! — simeon hall jr.
More than just Good Tails! Did you know that up to 75% of all lobster hears are simply discarded. Today's recipes teach you how to use all of the product. From the dawn of August 1st until midnight March 31st, the majestic Atlantic Ocean and The Bahamas’ “sea police” grant us the opportunity to harvest one of life’s greatest treasures from her chest. I speak of a crown jewel that makes these Islands of Paradise even more extraordinary – the spiny lobster, also known as crawfish. “Lob-sta” season is here! Sadly, season after season this delicacy is only harvested for the meat found in its abdomen or its tail. As a Chef immersed in the thought that “if you kill it, you eat it, and you eat every piece”, not using as much of an animal as possible disturbs me a great deal. So in early August, I journeyed to the shores of Montague Beach where Fisherman Marcus gave me a dozen heads for pennies, from tails he had just sold. Below are the recipes and tips that were developed with the “home-cook” in mind, particularly those who share my convictions regarding using as much of an animal as possible. 1.Spiny Lobster/ Crawfish butter: Use this butter as you would any; but be aware of shellfish allergies. The shells of lobster, shrimp and crab all turn orange when cooked because to the carotene which has fat-soluble molecules, similar to those found in carrots. Cooking the shells in butter and other oils brings tons of flavor and a bright orange color. Note- *Okay so you want to be a true Foodie. To get started, you must have a good set of knives, a proper kitchen apron, a digital scale, a thermometer and have at least 2 favorite dishes that you can easily prepare. Return this purée to the stove and cook for an additional 10 minutes on medium heat. This will intensify the lobster flavor. Then double line the fine strainer with a cheesecloth and strain. At this point the liquid should still be warm. Return it to a clean blender and gradually add the cold butter. Pulse on medium speed, forming an emulsion. Place this liquid in a shallow pan and refrigerate over night. The next day, remove the hardened butter from the surface and the lobster liquid will remain. Reserve this for later use. In a small pot bring the butter to a gentle boil stirring it constantly on a very low heat. Strain for a final time and place into the ice tray. Refrigerate until hard and use as desired. 2.Creamy Lobster and Potato Soup: A digital scale; a fine strainer; cheesecloth; blender; and a candy thermometer are the only Special Equipment needed. Don't be cheap. Buy tools. Presentation Tip: For a more elegant experience, in a warm bowl add a heaping tablespoon of room temperature lobster salad, blanched frozen green peas, local pea shoots, and a drizzle of lobster butter (see recipe above). Then pour or ladle 6 ounces of hot soup tableside for your guests. This is an adaptation of the classic lobster bisque that was traditionally thickened with rice. Here, the potato is used also to impart a unique flavor to this seasonal delight. Wash, rinse and dry the lobster shells, then cut into manageable pieces. In a large pot add the canola oil and then the shells. Sauté for just a minute then add onion, carrots, bay leaf and celery. Add the tomato paste and sauté for 4 minutes. Add the distilled water and immediately cover and simmer on medium heat for 1 hour. In a separate pot, cook the potatoes and heavy cream until the potatoes are tender. At this stage, remove the lobster stock, then blend and strain. By blending it with the shells, the lobster flavor is intensified. (Remember; be careful when blending hot liquids). Then double line the fine strainer with a cheesecloth and strain. At this point the liquid should still be warm. Return the liquid to a clean blender and add the hot the milk and potato, then pulse. Add as little or as much of the potato to obtain the thickness of the soup you desire. Bring the mixture back to a boil and whisk in the cold butter and brandy to finish. Optional Garnish: Whisk a bit of cold, heavy cream until frothy. Spoon a dollop on top of the soup with a drizzle of lobster butter. Add home-made potato chips prepared by frying thinly cut slices of potato (skin on or off) in 365° F Canola oil until golden. Heavily salt and place a mound of fresh chips next to the tea cup. Chef Tips: Try buying the entire animal. The head and body section has some of the tastiest “offals” and cheek meat that you can simply serve with grilled bread as an appetizer or a snack for you and your guest. ·Don’t boil crawfish or tails whole by submerging in regular tap water. Try steaming them in boiling sea water, covered with clean local ocean seaweed or oven baked them in clean local ocean seaweed. Cooking them using the elements in which they live will produce a better taste. 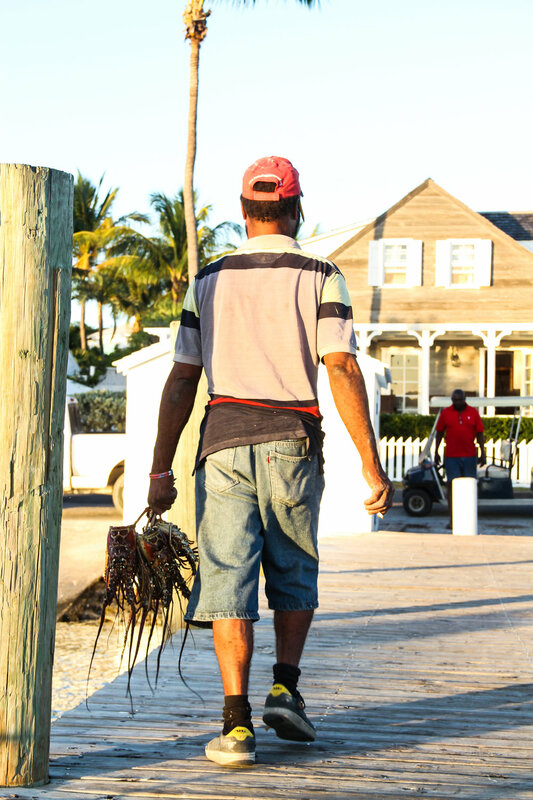 ·Always buy lobster from a reputable fisherman that keeps them iced down in a cooler. There are many fishermen at Montague Beach that have great practices. Also, Bahamas Food Services sells live whole crawfish which are sold locally to many local restaurants and exported as far as Europe as well. Moreover, take a cooler or a cooler bag with ice when shopping for lobster in order to keep them fresh for the journey home. ·Always buy fresh and whole lobsters that smell like the ocean and are free from any visible damage. Also, inspect the connection between the tail and the body underneath and ensure that it is not black. ·Only buy lobster meat from a highly reputable fisherman or supplier. Unscrupulous suppliers often harvest lobster meat from the tails of underage, undersized animals. This is not only unlawful, but it depletes the lobster population at an unhealthy rate. ·When purchasing butter always buy premium unsalted butter. Salt is often added to mask the flaws and inferior quality of most brands. Unsalted butter is often a higher quality. ·Remember that the more your smell your food when it’s cooking means the more aroma or flavor is being lost. Keep it tightly sealed at all times to retain as much flavor as possible. School notes- Equal parts carrots, onions, celery used to flavor stocks and soups is called a mirepoix . After a long day on the seas.